David Bowie is takes its final bow at the Brooklyn Museum, March 2-July 18, 2018, providing one last opportunity to view one-of-a-kind material from Bowie’s personal achieve. The exhibition explores the creative process of an artist whose sustained reinventions, innovative collaborations, and bold characterizations revolutionized the way we see music, inspiring people to shape their own identities while challenging social traditions. David Bowie is presents approximately 400 objects drawn primarily from the David Bowie Archive, including the artist’s original costumes, handwritten lyric sheets from famous songs, original album art, photographs, and videos, all tracing Bowie’s creative process from his teenage years in England through his last twenty years, when he resided in New York City. The archive is presented within an immersive, multimedia installation that includes continuous audio along with projected animation and video. 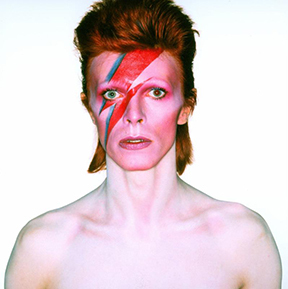 David Bowie is is organized by the Victoria and Albert Museum, London. The Brooklyn Museum presentation is organized by Matthew Yokobosky, Director of Exhibition Design, Brooklyn Museum. Lead sponsorship for this exhibition is provided by Spotify.